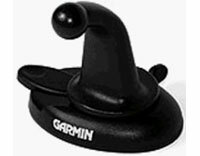 Garmin Automotive Dash Mount (010-10747-02) | Discount GPS Accessories from mysatnav.ie Ireland's leading GPS & Sat Nav store. This is a compact automotive dash mount that can be adjusted easily. For the nüvi 2xx series attach the mounting adapter from the windscreen mount to the auto mount, for the StreetPilot 5xx series simply attach the GPS directly to the mount. The mount can be swivelled easily so that yon position your GPS for the best viewing angle. The base of the mount is attached to your dashboard using either one of the included permanent or temporary adhesives.